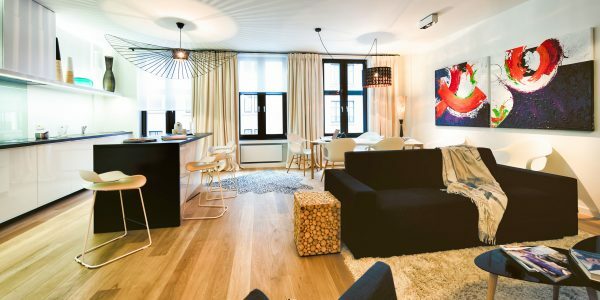 Nice contemporary styling 100m² apartment – two bedrooms, two bathrooms and a quiet balcony – located in the heart of Brussels’ historic area of Ilôt Sacré – opens on to large living/dining area with fully-equipped kitchen. Accessed by an elegant Art Deco black and white colour scheme staircase with elevator, the flat can host up to 6 people. 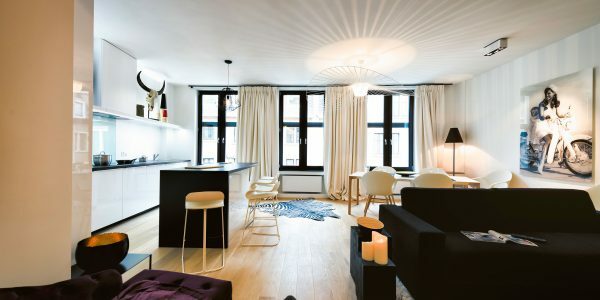 Located on the top floor, the apartment has a well-lit environment and is characterised by a typical Brussels’ height sub-ceiling. Specially designed and equipped for your comfort, the living room has everything you need to feel at home. 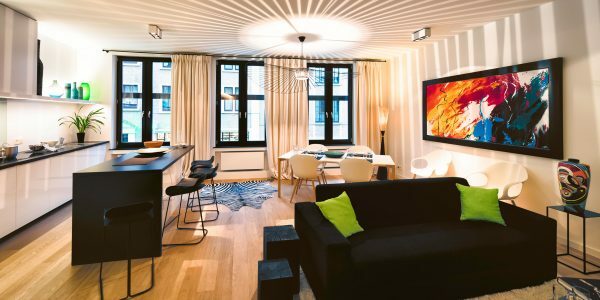 With its refined decoration, the apartment is dominated by the use of shape and colours – with coloured artworks – which offers a pleasant visual impact to your stay. The living area has a cosy atmosphere with its wooden parquet floors, designed pendant lights and soft rugs. You will have the opportunity to enjoy a relaxing evening in the lounge area on a large convertible sofa watching a movie among various channels. The main bedroom is furnished with a queen sized bed, flat screen TV / large bathtub / and separate toilets and has access to a balcony. The apartment also includes an extra bathroom vanities with an Italian shower and toilets.